Insert a standard RJ11 telephone cable into the Phone port and connect the other end of the telephone cable to a standard touch-tone analog telephone. 2. Allow a minute or two for the HT701 to boot up and get an IP address. 3. Pick up the connected analog phone, and dial *** to enter the IVR. 4. Dial 02 to hear the assigned IP address. Write this address down. 5. Type the assigned IP address into the address bar of your web browser (Google Chrome, Internet Explorer, Mozilla Firefox, etc.) and press ‘Enter’ or ‘Search’ to access the web configuration page. 8. Click the SIP Trunking tab, then select Trunks. 17. Choose the STATUS tab, and confirm that the device shows it is registered. 18. 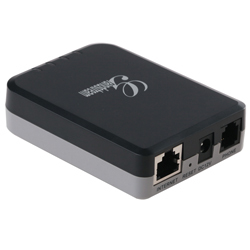 Your Grandstream HT701 is now registered to your SIP.US SIP trunk.